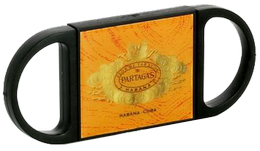 Partagas brand cutter. For cigars with ringgauge up to 52. With a double blade for a perfect cigar cut. ABS plastic material in black and orange with the Partagas logo in front.